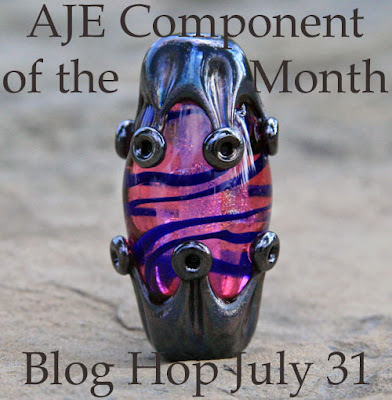 I was lucky enough to win a drawing for one of Jennifer Cameron's wonderful Nightmare Insomnia Lampwork beads. This was part of a challenge sponsored by Art Jewelry Elements. And today is the big reveal. All we had to do was use our amazing bead in a piece of jewelry. Easy right? Weeeellll, At first I didn't think so. Here is the bead I won. So in a way this is an emotionally charged bead. I suddenly knew what I wanted to do. I wanted to turn the nightmare into a sweet dream. I couldn't get wild with dangles, crystals and fiddly bits, Uh-uh, no tassels, although I was tempted. So I started looking through my stash of seed beads and came up with some coordinating colors. A trip to the discount store resulted in the purchase of some bar shaped glass beads in cool colors - two of which coordinated with the Nightmare Insomnia bead. And after quickly laying out and stringing the main part of the design, it sat for a few days. I didn't know how to finish it. Ok, a couple of cones, then what? I really like magnetic clasps, for their practicality and also their ability to blend into many designs. But I needed something a bit more assertive. I went back to the store and came back with several clasps. Some small but decorative toggles, and a little larger, fancier magnetic clasp. Then I went with my gut. Magnetic it was. Here is, A Daughter's Sweet Dream. The camera liked my concrete steps better than the black velvet, go figure. 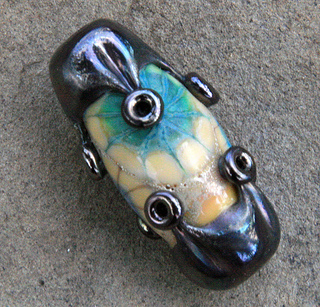 Please visit these talented Artists to see what they have come up with for their unique bead! This is a fun blog hop. I love seeing how everyone used these beautiful art beads in their creations. Mine was difficult to photograph, too. They are just one of the 'better in person' beads! You did a great job! Thanks for stopping by! I had fun trying to pick out the soothing elements! Very pretty necklace Beti! I love how you brought out the blue of that beautiful spider web that's nestled in Jen's bead! Lola, somehow I combined two replies that other day. See below about the "spiders" or webs. Unlike many of the NI beads I have seen, this one has the neutral background color. I really tried to run with that to create something peaceful! Your white and dark seed beads really bring out the pattern in the focal bead! 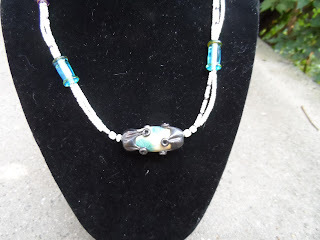 Love those glass tubes--just enough pop to bring out the color in Jen's bead! I wish I had gotten shots with all the "spiders" The bead is phenomenal. I'm just having a great time designing things that I never would have imagined a few months ago! And what a great "story." 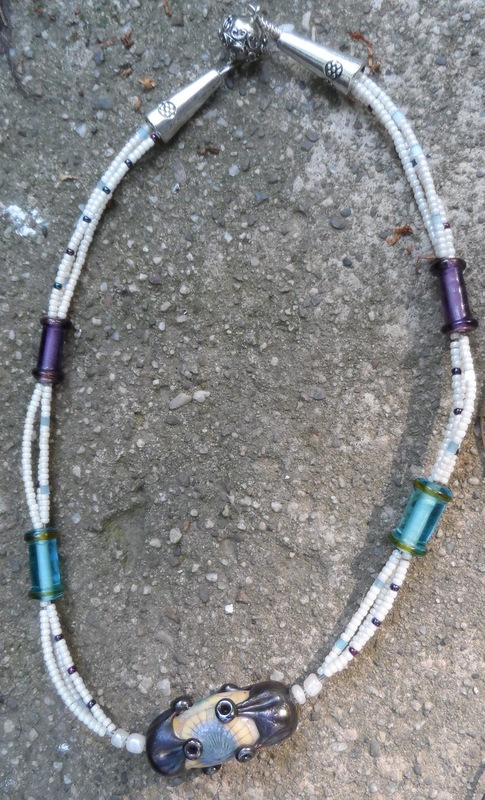 Beautiful necklace you did a great job at making the glass bead focal even more beautiful with the colors you chose. I really wanted the eye to be drawn to the focal. Thanks! Lovely. You did a wonderful job letting Jen's bead hold center stage. I'm so glad I had this chance to play with an exciting bead. Thanks for your comment. Oh Beti! I think it turned out wonderful! 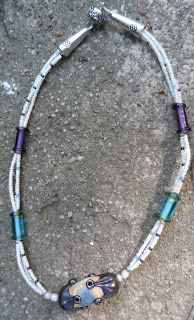 The seed beads are great and the glass beads add a nice balance and color. Thanks so much for joining in on the fun. I hope it was fun for you! This was a great experience! 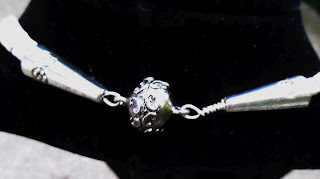 I really enjoyed designing with your bead, and also, I am gaining a lot of good experience blogging! I admired that bead when I first saw it. It is a sweet dream! I love that you used seeds and frankly my go to clasp for necklaces is usually magnetic! Awesome! Thanks. I loved working with that bead. Beautiful bead and love your design. I couldn't think how to use the bead horizontally and you did it well. I almost always use the deck as my backdrop now beads look much better on weathere wood than they do in photo cubes... your concrete is a similar colour! Is your clasp magnetic? Great piece! What a beautiful way to bring it back around!I love your design, and those bar beads are very cool!